Ultiworld’s 2018 Catch of the Year bracket is presented by Friction Gloves; all opinions are those of the author. Please support the brands that make Ultiworld possible and shop at Friction Gloves! Over the last week and a half, our readers have weighed in on their favorite grabs of the year and selected a pair of fantastic nominees to duke it out in the final. After a back and forth battle, Pranav Rajan pulled away late to earn the title of 2018 Catch of the Year. In one of the tighter matchups we’ve seen in this year’s competition, Pranav’s U24 World Championships snag captured 56% of the vote to surpass another young star in the making, Allyn Suzuki of California Current. With the margin always close, Suzuki led as late as with 18 hours to go, but Pranav saw a late surge to claim victory. Congratulations, Rajan! Thanks also to everyone who participated in this voting over the past couple weeks! 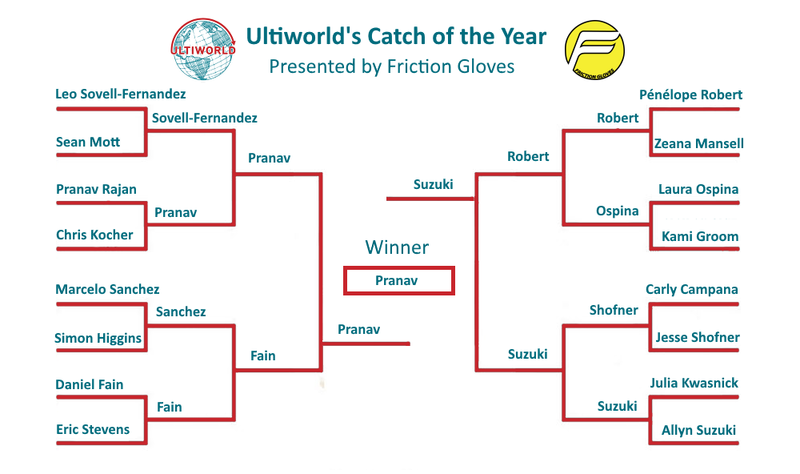 Comments on "Ultiworld’s 2018 Catch Of The Year Bracket: Pranav Rajan, Presented By Friction Gloves"